Members of the racist group, League of the South, gathered to meet and make their views known publicly, but heavy rain kept them indoors and away from the limelight. The League, a racist and neo-Confederate group based in Wetumpka, Alabama, opted to forgo the usual public display of waving the Confederate flag and waving at cars along U.S. Highway 231. Instead, League members huddled in the group’s headquarters as rain fell and lightning lit up the sky on a steamy Saturday for the organization’s national conference. The gathering was scheduled to feature multiple well-known racists, anti-semitic speakers and neo-Confederates. The digital sign near the road boasted of League of the South Chief of Operations Robert Issacs, aka Ike Baker, Florida Chairman Michael Tubbs, ex-mercenary Jim O’Brien and southern nationalist Bradley Dean Griffin as speakers. Italian authorities cited a group David Duke was allegedly forming in their expulsion order, but offered no details to support their contention. 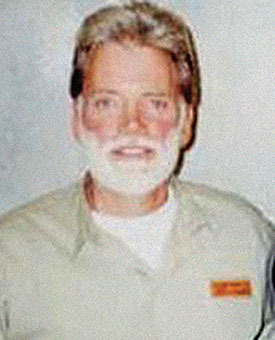 The meeting was the first since the Southern Poverty Law Center publicly identified Vincent Buckles, a former reality television star, as the main Louisiana contact for the League of the South, taking over for John Mark “Tiny” Malone, who appears to have left the organization after Hatewatch documented his participation in the group’s 2017 national conference. SPLC also gave a rundown of the group’s leadership changes since the 2017 conference. But, the weather kept those efforts publicly muted on Saturday. As a steady rain fell, multiple people huddled under a covered opening near the entrance to League headquarters during a scheduled break. Just yards away, several dozen cars and trucks were parked on headquarters grounds, with many facing the street and obscuring the license plates – and potentially the owner’s identity – from traffic passing on a nearby highway. 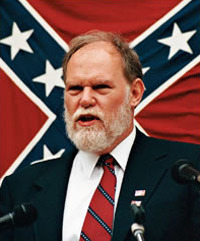 The League has not been shy in the past about waving the Confederate flag and making known its call for a white ethno-state primarily in the Southeast United States. But, the rain appeared to trump whatever strong feelings the group had at this year’s conference to make their call public.